Regeneron Pharmaceuticals announced that the FDA has approved Eylea (aflibercept) injection for the treatment of diabetic retinopathy in patients with diabetic macular edema (DME), according to a company news release. In 2014, the FDA granted Eylea breakthrough therapy designation and priority review for the treatment of diabetic retinopathy in patients with DME. The recommended dosage of Eylea in patients with diabetic retinopathy in DME is 2 mg every 2 months (8 weeks) after five initial monthly injections. Although Eylea may be dosed as frequently as 2 mg every 4 weeks, additional efficacy was not demonstrated when Eylea was dosed every 4 weeks compared to every 8 weeks. Eylea is available as a single, 2 mg strength intravitreal injection for all approved indications. Eylea was previously approved in the United States for the treatment of wet AMD, macular edema following retinal vein occlusion (RVO), and diabetic macular edema (DME). 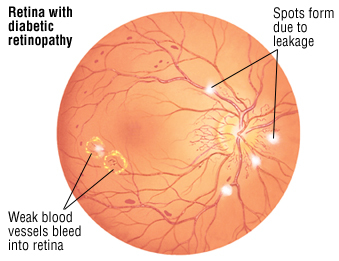 The approval of Eylea for the treatment of diabetic retinopathy in DME was based on 2-year data from the phase 3 VISTA-DME and VIVID-DME studies of 862 patients, which compared Eylea 2 mg monthly, Eylea 2 mg every 2 months (after five initial monthly injections), or macular laser photocoagulation (at baseline and then as needed). In these studies, on the primary endpoint of mean change in best corrected visual acuity (BCVA) at 1 year, patients treated with Eylea monthly or every 2 months showed statistically significant improvements compared to the control group. Patients in both Eylea groups gained, on average, the ability to read approximately two additional lines on an eye chart compared with almost no change in the control group. A pre-specified secondary endpoint in the studies at year 2 evaluated diabetic retinopathy severity based on an established grading scale measuring retinal damage. In the VISTA-DME trial, 38% of patients receiving Eylea monthly or every 2 months (after 5 initial monthly injections) achieved a 2-step or better improvement on the diabetic retinopathy severity scale (DRSS), compared to 16% of patients receiving control. In the VIVID-DME trial, approximately 30% of patients receiving Eylea monthly or every 2 months (after 5 initial monthly injections) achieved a 2-step or better improvement on the DRSS, compared to 8% of patients receiving control. In these trials at year 2, Eylea had a similar overall incidence of adverse events (AEs), ocular serious AEs, and non-ocular serious AEs across treatment groups and the control group. Arterial thromboembolic events as defined by the Anti-Platelet Trialists’ Collaboration (non-fatal stroke, non-fatal myocardial infarction, and vascular death) also occurred at similar rates across treatment groups and the control group. The most frequent ocular treatment emergent AEs (TEAEs) observed in the VISTA-DME and VIVID-DME trials included conjunctival hemorrhage, eye pain, cataract, and vitreous floaters. The most common non-ocular TEAEs included hypertension and nasopharyngitis, which occurred with similar frequency in the treatment groups and the control group.